There’s a great line in “The Right Stuff” by Tom Wolfe where the pilots sober up before flying after a long night of heavy drinking by breathing pure oxygen to burn off the alcohol: “I don't advise it, you understand, but it can be done”. This comes back to me because I went on a night shoot last week and had to use what is definitely not the recommended procedure. 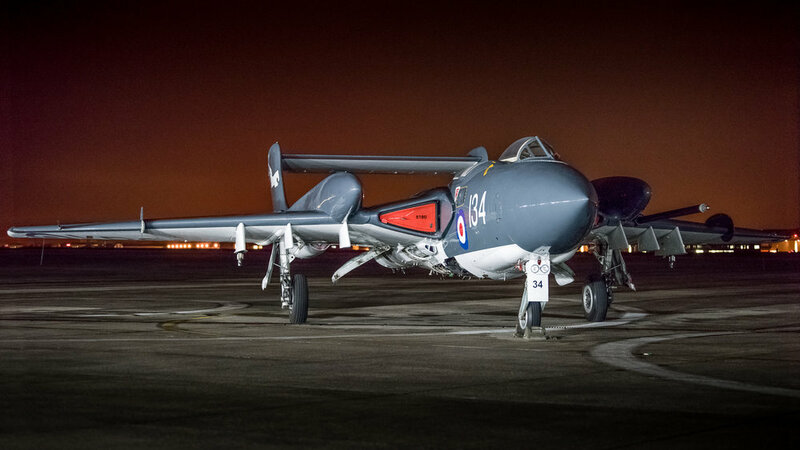 I’ve blogged elsewhere about shooting aircraft at night, and a key element is using a tripod to enable the long exposures needed under the dim lights available on a pan in front of a hangar. 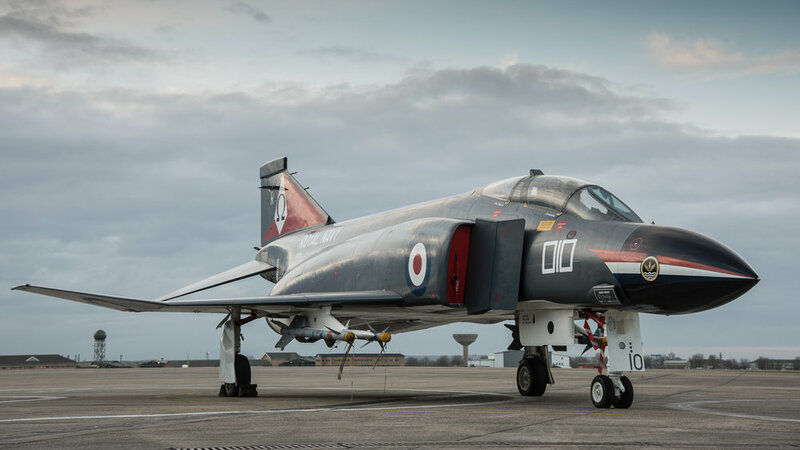 I was on my way from east Kent to Yeovilton in Somerset, when halfway around the M25, I realised I had left my tripod behind. Good grief! I’d remembered to put the tripod plates on the camera and on the foot of the tele-zoom, but did I remember to put the tripod in the boot? No. So feeling like a complete Charlie, I headed on down to Somerset anyway. At least I had my fast 50mm f/1.4 and the 70-200mm f/2.8 with me, so after dark, I’d be able to open up wide. ISO6400 it would have to be. As it happened, the shoot started before it got dark, so there was time to get some wider shots with my normal 24-120mm f/4, but the ISO crept up rapidly, and when it hit 1600, I switched first to the 50 and then the 70-200. One of the tricks that is really useful under these conditions is to take multiple replicate shots of the same scene, with a view to combining them in Photoshop in a way that reduces the high-ISO electronic noise. The idea is that the electronic noise in a digital image is random, which means that the noise pattern varies from one shot to another. In any series of replicate shots, most of the values for any one pixel will be the same, but a few will be affected by noise. If it is possible to identify the most common data values for each pixel (i.e. the median values), it should be possible to discard the outliers, and so throw away the noise. To do this, once it got dark I took around 20 replicate shots of each scene (using 14-bit RAW). Although everything had been carefully lit, there just was not that much light, so I was shooting around 1/10 sec handheld, at f/2 (50mm) or f/2.8 (70-200) and ISO 6400. The reason for taking so many was to try to get 4-6 sharp from each scene: at 1/10 sec, most are going to be blurred from the wobbling of my hands. Fortunately, that worked really well. In fact, the VR (image stabilisation) on the 70-200 is so good that it got far more shots nicely sharp than I had any right to expect. There are loads of tutorials about this on YouTube, but, briefly, the median noise reduction method is like this. First, bring the replicates into Lightroom, and check the EXIF values to make sure they all were taken on exactly the same settings. Then, just a little basic processing (crop and straighten, white balance) and make sure all the settings are synchronised. Open the files in Photoshop as layers in a single image (select them all in Lightroom grid view, right click on them and choose Edit in, then Open as Layers in Photoshop). Select all the layers and auto-align them (Edit menu): this is really important because however still you hold a camera, it will move fractionally between shots and it is vital the pictures are properly aligned. Keeping all the layers selected, convert them to a single smart object (I use the flyout menu on the Layers panel). Then from the Layers menu, go to Smart Objects, then Stack mode and choose Median. This will calculate the median values for each pixel in all the layers. Using 4-6 images doesn't get rid of all the noise, but it does a really good job, reducing it by perhaps 2-3 stops-worth. 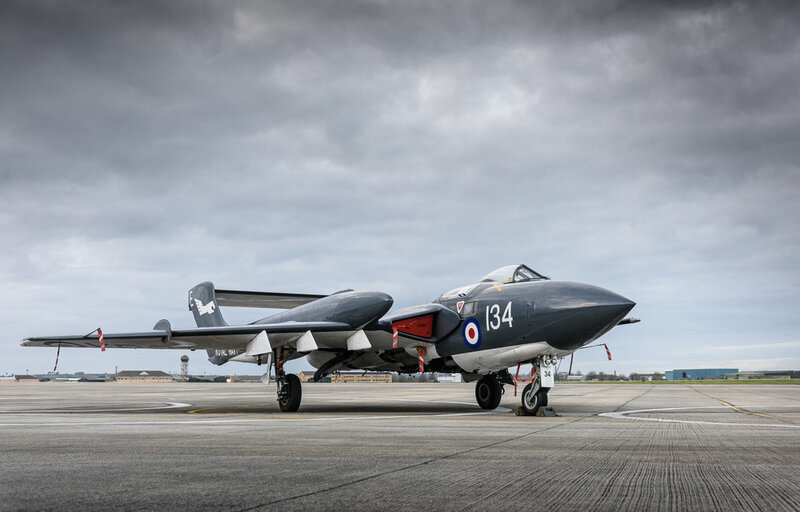 The top two images show pictures of the Sea Vixen treated this way. 100% view of the effect of median noise reduction, from the second picture above. Click to view larger. Looking at 100%, it is easy to see the effect of the median noise reduction. Nevertheless, ISO6400 on a D810 is pretty good, and reducing the image size to 1600px on the long edge is such a large scaling down that most of the noise disappears anyhow. If I were making A3 prints, for certain, I would use the median method. Otherwise, for just posting on the web, perhaps it is not necessary. Westland Sea King HAS.1 XV666 currently operated by HeliOperations. 50mm, f/2, 1/25sec, ISO3200: for web display, the median noise reduction method really is not needed. The other consideration, of course, is that this method only works if there’s no movement in the image. For the one of the Merlin below, the median method was not possible because the people were moving. Augusta Westland EH-101 Merlin HC3 ZJ130. Try as they would, the guys gathered to the left the could not get it to start up! Still, it is definitely worth knowing about the median method. Night shoots without a tripod are something I would absolutely not advise, you understand - but they can be done. Just to finish off, here are a few more shots from the evening, which, despite no tripod, rain and two helicopters that would not start up (and one that was u/s and could not even get there), I thoroughly enjoyed.